Christopher Walken is walkin’ on sunshine. And you know he could do that number while dancing. He’s a very talented man and such an iconic figure on the big screen. 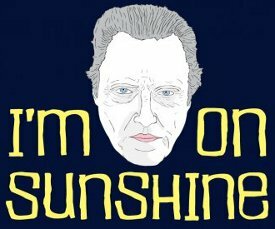 That is why if I was a betting man, I’d say there’s a 92% chance you’ll buy I’m Walken on Sunshine Tshirt today. And, of course, More Cowbell. Busted Tees is the perfect shirt company to celebrate the career of the Walken legend.